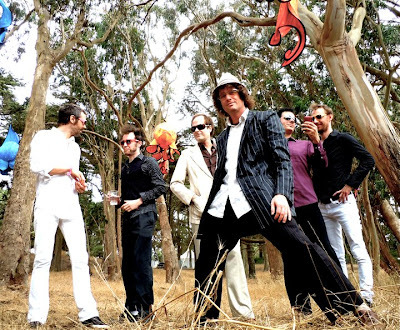 Hip In Detroit: Win Tickets to Electric Six at St. Andrew's!!! Detroit six piece Electric Six is coming back to the place where it all started. This Saturday, September 7th they will be bringing their high voltage music to the stage of St. Andrews Hall. No one incorporates disco, garage rock, and and pop quite the way that this group does.The first time I was at a huge party and heard “Gay Bar” blasting on the speakers, everyone in the room started dancing. I'm sure that the room will be bumping this Saturday as they film their show for a live DVD to be released in the near future called Absolute Treasure. The band asked their fans to help them raise money to shoot this video. They wanted to raise $25,000 and to this date there is already well over $60 grand pledged. Now those are some devoted fans! Well, we want to give three of the those fans a chance to go to the show/video taping this Saturday for free. Three lucky winners will have their name on the guest list with a +1. You may want to dress your best because their is a good chance you may end up in the final video! To add to the excitement of this show, local heavy hitters Lord Scrummage are opening up. To enter to win tickets just email your full name to hipindetroit@gmail.com. Make sure you put "Electric Six" in the subject line too! We will draw three lucky winners on Friday morning and send them an email with instructions on how to claim their tickets. So get your best dancing shoes out and head up to St.Andrews this Saturday! For those of you that aren't willing to wait and want to guarantee a spot at the show, you can purchase tickets for $13 dollars in advance here.